Primordial atmosphere Mars may have been enveloped in a thick, steamy atmosphere as the planet's crust cooled and solidified. That steam bath could have created the clay minerals that have long been attributed to water flow on or just beneath the surface. New research suggests that the bulk of clay minerals on Mars could have been formed as the planet’s crust cooled and solidified, not by later interactions with water on the surface as has long been assumed. 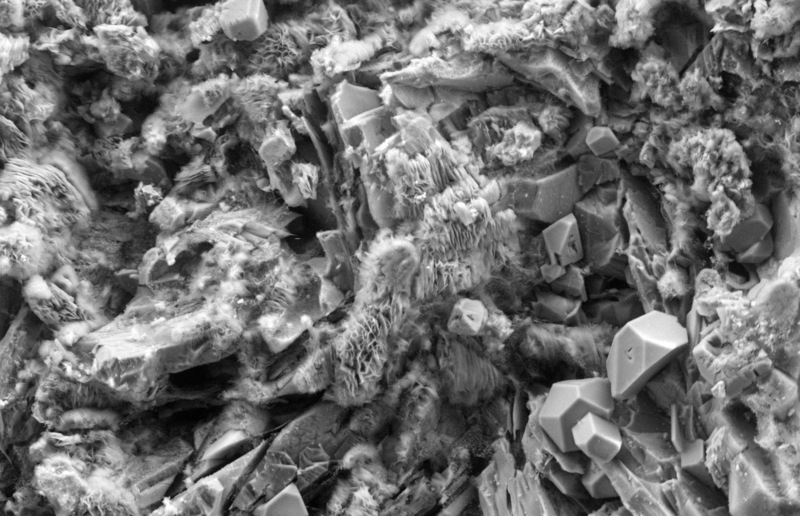 PROVIDENCE, R.I. [Brown University] — Planetary scientists from Brown University have proposed a new scenario for the formation of ancient clay minerals on Mars that, if shown to be true, could rewrite the early history of the red planet. There are thousands of ancient phyllosilicate outcrops on the Martian surface. Phyllosilicates, or clays, are formed by the interaction of water with volcanic rock, leading many scientists to conclude that there must have been sustained surface water, groundwater or active hydrothermal systems at some point in Martian history. But the new research, published in the journal Nature, suggests that the clays may have formed during the creation of the Martian crust itself, long before any water flowed on the planet. Backed by lab experiments and computer models, the researchers lay out how the scenario would have worked. In the very early solar system, Mars and other rocky planets are thought to have been covered by oceans of molten magma. As the Mars magma ocean began to cool and solidify, water and other dissolved volatiles would be outgassed to the surface, forming a thick, steamy atmosphere surrounding the planet. The moisture and heat from that high-pressure steam bath would have converted vast swaths of the newly solidified surface to clay. As the planet then evolved over billions of years, volcanic activity and asteroid bombardments would have covered the clays in some places and excavated them in others, leading to the widespread but patchy distribution seen on the surface today. Cannon and his co-authors say the scenario offers a means of creating widespread clay deposits that doesn’t require a warm and wet climate or a sustained hydrothermal system on early Mars. State-of-the-art climate models suggest an early Mars where the temperature rarely crept above freezing and where water flow on the surface was sporadic and isolated. To demonstrate that the mechanism they propose is plausible, the researchers synthesized rock samples matching the composition of Martian basalt. They then used a high-pressure device to recreate temperature and pressure conditions the may have been present amid the steam atmosphere created by a magma ocean. After cooking samples for two weeks, the team checked to see if they had been altered and to what extent. The steam atmosphere associated with a magma ocean could have survived for as long as 10 million years or more, Cannon and his colleagues say. That would have been long enough, they estimate, to create as much as three kilometers of clay on the primordial Martian surface. To get an idea what the fate of that clay might be as the planet evolved, the researchers created a computer model to simulate a slab of Martian crust with a three-kilometer clay layer on top. Then they simulated the first billion years of Martian geologic history — the period when volcanic activity and asteroid bombardment were most prevalent. The model showed that the burial, excavation and scattering of clays over time created distribution of exposed deposits similar to what’s seen on Mars today. The lab experiments and simulations can’t say for certain that this scenario occurred, the researchers say, but they do suggest a strong hypothesis that could be tested during future Mars exploration. If the process did indeed occur, it could have some interesting implications for early Martian history. In addition to providing a mechanism for clay formation even if Mars was as cold and icy as climate models suggest, the scenario suggests that vast deposits of clay were — and might still be — present beneath the surface. Those deposits could explain why the Martian crust is less dense than expected for a basaltic crust, the researchers say. The deposits would also serve as large underground storage reservoirs for water. Mustard, who chaired the committee that laid out the science goals for NASA’s Mars 2020 rover, hopes this new hypothesis could inform future Martian exploration.